Bold360’s customer engagement solution makes the transition from chatbot to human agent a completely seamless experience. The full history of the interaction is carried over to the agent, so the customer never has to repeat themselves. 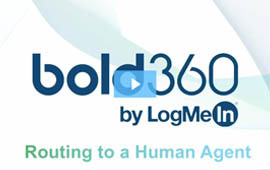 Bold360’s artificial intelligence continues to support this engagement even after passing it off to a human, and the agent can also provide feedback to the smart advisor, improving results with every interaction. Whether talking with a chatbot or human agent, Bold360 makes it easy for your customers to get the answer they need. When bots and humans work seamlessly together, your customer wins.